Hello again, friends. Last week we completed the speaking section of PTE academic. To make your understanding simpler, we published 2 blogs about PTE Speaking Test. If you have not read those blogs, please read the1st blog about speaking and 2nd Blog about speaking). This week we will give you an introduction to the PTE Writing Test. It has two kinds of questions, namely (i) summarize written text, and (ii) essay. First, we will look at summarizing written text. Good To Excellence is Pearson recommended training institute for preparing PTE academics exam. If your interest is to appear for this exam, it is good to read our earlier blog article “What PTE exam is about” (http://goodtoexcellence.com/what-pte-exam-is-about/). You can contact us and schedule your joining. In this type of question, you will typically get a passage of about 300 words. There may be 2~3 tasks. The time given is 10 minutes for each question. you must make use of the time to accomplish the task. Therefore, your testing is on your ability to read understand the main points and write the summary in 5~75 words but in a single sentence. This task is a little challenging as the summary has to be written in a single sentence. We give you practical and positive tips on how to connect different ideas and give you words and phrases to write in a single sentence. We also train you to manage your time more efficiently. You may get one or two essays. Time allotted for each is 20 minutes in which you think, plan and write an essay. The word limit is 200~300 words. There are different kinds of essays. Therefore, your assessment is on various factors such as content, coherence, vocabulary, grammar, word count, sentence structure, spellings, etc. if you are not good at spellings now is the time to improve if you are planning to take the test. Both American and British spellings are accepted. However, you need to stick to one style throughout the test. Our training will prepare you to organize your essay coherently and also to think, plan and write keeping in mind the assessment criteria. We give you phrases for various functions in the English language which will help you to construct sentences for effective writing. Approach to each kind of essay is different. We help you to identify the kind of essay and use the right approach. 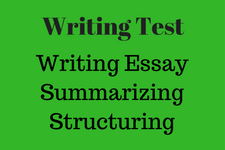 We are sure you now know the basics of attempting a PTE writing test. With that, we have come to the end of writing skill which is the end of section 1. Our plan for next week is to introduce you to the reading section. Till then, bye bye and have a great week and weekend.